Traditional ramen appears humble: soup broth, noodles, toppings and flavorings. It can be characterized by how it is constructed or served, ranging from vegetarian to meat protein as a base, and from hot to cold. Toppings including vegetables, a soft-boiled egg and various sauces allow you to customize the soup to your liking. Properly made, however, the soup involves a complex broth process, starting with kombu or dried seaweed, and proceeding with pork, chicken, soy sauce, etc., to achieve depth of flavor. Unlike the packaged dry ramen noodles popularized in American grocery stores, tender noodles, freshly made, are essential to traditional ramen. Finally, there's a careful pairing of ingredients in and on top of the soup to provide maximum nutrition with minimal downside — full of protein, yet low in sugar and fat. And it's catching on in the Inland Northwest. Ginger Asian Bistro owners Josh and Jingou Hissong gave Spokane its first ramen house, Nudo Ramen (818 W. Sprague Ave.), and have since expanded (9602 N. Newport Hwy). A dozen variations — including miso broth with pork, shrimp tempura in a soy sauce-based broth, vegan — makes ordering ramen easy. Also try assorted pan-Asian appetizers, skewers and rice bowls. Visit NudoRamen.com. King of Ramen's (1601 N. Division St.) menu is very focused: fewer than two dozen appetizers and soups, with a handful of toppings like minced pork or sweet corn. Their broths — pork, chicken and vegetarian — are an all-day venture. A few rice dishes round out the menu; just like that, you're experiencing traditional Japanese cuisine. Visit KingOfRamen.com. Ding How restaurant's Bin Sun brought the first full-fledged ramen place to North Idaho with Umami Ramen (1927 W. Riverstone Dr., Coeur d'Alene), based on recipes and techniques he brought back from several ramen workshops in Japan. 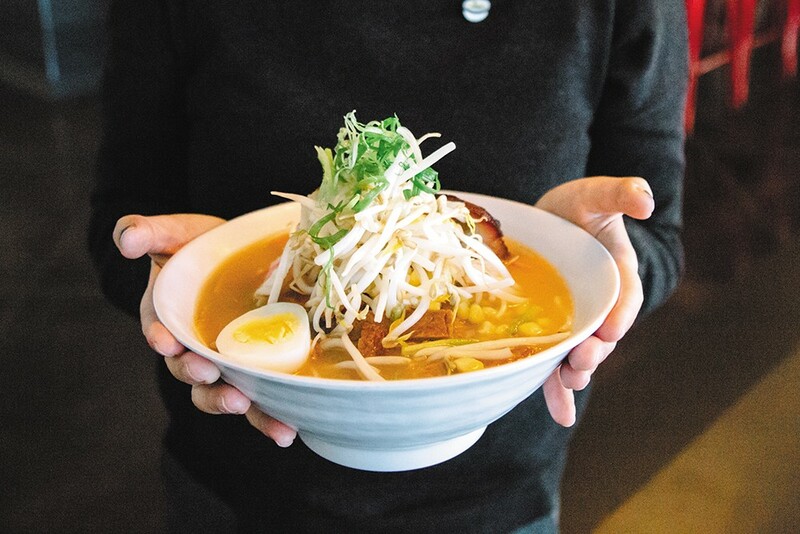 He labors over his broths, which include chicken, pork and other traditional profiles, adding homemade noodles for an authentic ramen experience. Visit Umami Ramen on Facebook. The next time you're at your favorite Japanese-style eatery, scan the menu for noodle bowls, including ramen. At Kaiju Sushi and Spirits (424 E. Sherman, Coeur d'Alene), for example, their ramen has a chicken-based stock. Kyoko Sushi (334 N. First Ave., Sandpoint, Idaho) inside the Cedar Street Bridge, features several noodle dishes, including ramen, udon noodles and Vietnamese .